Coastal Poodle Rescue was officially established on March 8, 2004 by a small group of dedicated volunteers who, combined, have decades of experience with statewide and local rescue efforts. The number of abandoned and abused poodles and poodle mixes in our local area was increasing at a disturbing rate. Therefore, we decided the best way to assist these animals was to form a regional rescue group. We are a non-profit 501(c)(3) corporation. We are 100% volunteer-run, and we "poodle" in our spare time. We concentrate our activities in the eastern, coastal corridor of Florida from Duval to Dade County. 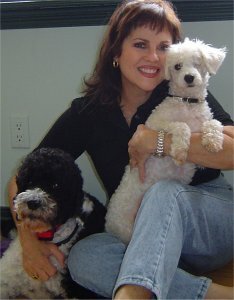 Because of our proven commitment to the poodles in our care, we enjoy an excellent reputation with the vets and groomers who work with us. However, we are always in need of working funds, we are all volunteer (no paid staff) and we operate on donations only. Donations are always appreciated! Please make plans to attend our fundraising events. We make them fun! We ensure that each dog is spayed/neutered, have their vaccinations updated, are microchipped, are tested for heartworms and other parasites, have a thorough vet exam, and are treated, if possible, for any known conditions found before adoption. All medical information is fully disclosed to new owners. The dogs are placed in foster homes that provide love and patience to help the animals adjust before being adopted. Their stays in foster care vary from several days to several months, depending upon the dog's condition and needs. CPR does NOT have a kennel or facility. Unlike shelter or kennel living, fostering in a home environment allows the personal evaluation of each dog for behavior and temperament issues. We learn how our dogs react to other animals, children or strangers. Coastal Poodle Rescue is a non-profit 501(c)(3) corporation. We are 100% volunteer-based, which means overhead costs are minimal and your donation is put to direct use for the good of the dogs. We do not receive government funds. We are entirely supported by charitable donations. We can only adopt in Florida since we require a homevisit. Visit petfinder to find a rescue in your area.